Out With the SOLD and In With the NEW! and In with the NEW! Among the several recently sold bikes, three of the four 1942 INDIANS (from the Civilian Collection) have been SOLD! Only ONE LEFT and it's SPECIAL! Have you ever heard of a 42-inch JR Scout? Check it out! • 1963 BSA Rocket Gold Star Spitfire ... incredible beauty! 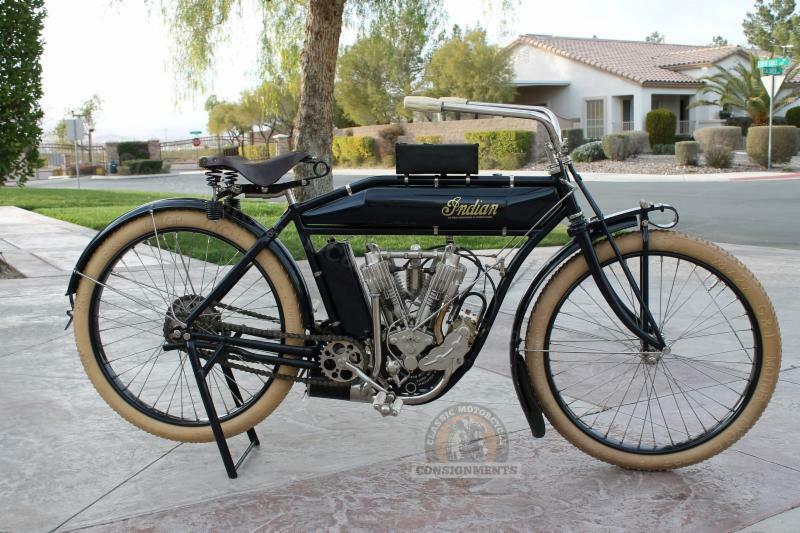 • 1911 Indian Twin - Hedstrom... incredible piece of Indian Motorcycle History! Featuring 100 Bikes from the Jim Lattin Collection. if you're unable to attend. Thanks for your continued support and reading our occasional emails. Check in to the site often to see what's new and feel free to share our newsletters on Facebook and other social media. Cheers from the Staff at Classic Motorcycle Consignments! You don't want to miss this! Greetings from Classic Motorcycle Consignments! We want to take this opportunity to thank those that called and asked for information about bikes presented at the auctions in Las Vegas and let you know about our Newest Arrivals. Both Las Vegas events were quite successful with over 2,000 bikes on display and 95% being sold. Tim was quite busy answering the phone and assessing bikes for clients. Nice to get a firsthand view of the bike and not count solely on the pictures in the catalog or on the internet. We successfully bid on 4 of the 25 bikes we reviewed. Clients were talked out of bidding wars on two occasions and we advised them not to bid at all on 5 others. Yes, Tim will be there again in June so that you do not have to fly in and spend hotel time and social time to look at your next investment. Please give us a call ahead of time so that we can do a great job assisting you in the upcoming auction in June. We have several new arrivals coming in for consignment. ... This will include the three remaining 1942 Indians from the original collection of four . The collection was sold at a good price and the buyer will keep the 1942 Four and possibly the 1942 Sport Scout. 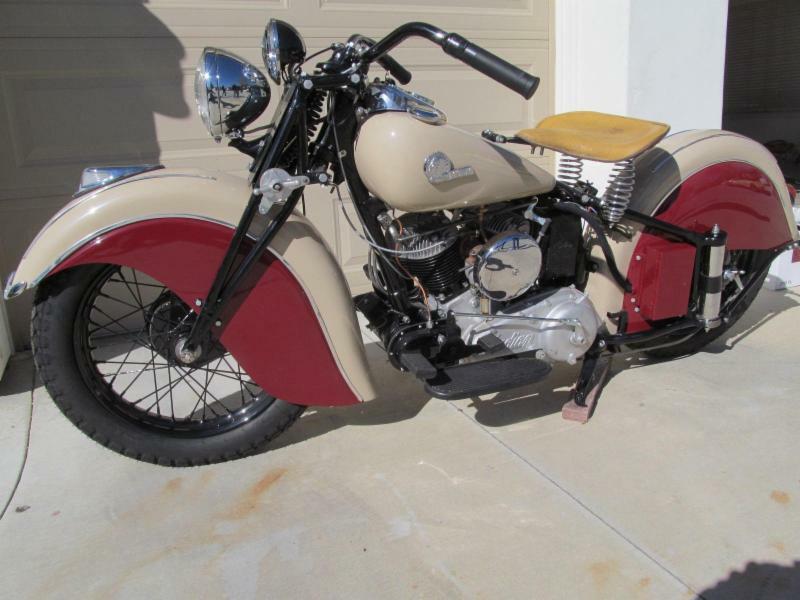 The 1942 Chief and the 1942 JR Scout will be relisted for immediate sell. We hope to have the incoming bikes posted for sale by the end of next week, so please review the site often and subscribe to the newsletter so that you get first view of the opportunities. We see an increase in the buying of classic motorcycles and strong prices. We are also receiving quite an increase of bikes for sale. Thanks for all your help! If you know of anyone holding bikes or parts and they do not want to go straight to the eBay way, we are glad to help. Don’t forget to check out the three gorgeous Knucklehead Bobbers ! They remain available and are all great lookers and superb runners! 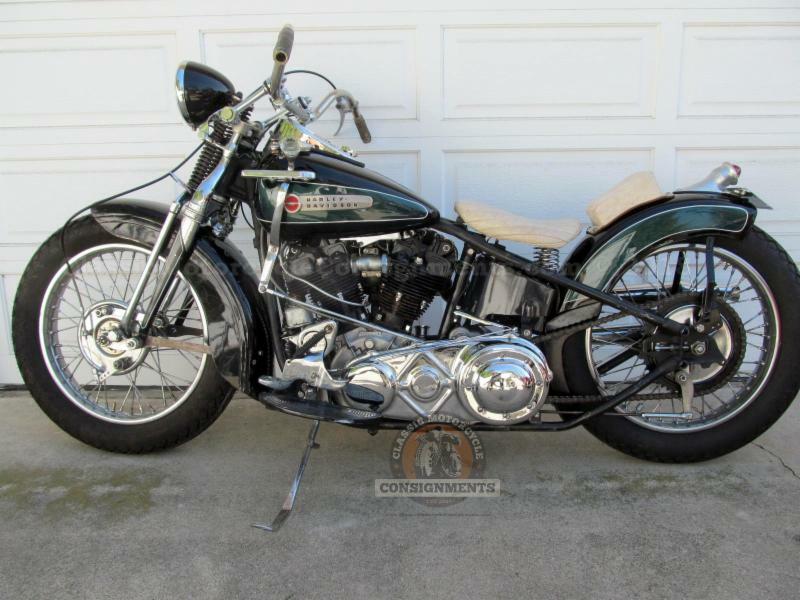 This 1947 Harley Davidson EL Knucklehead Bobber has only 600 miles on it. It runs perfectly and is a first-kick! 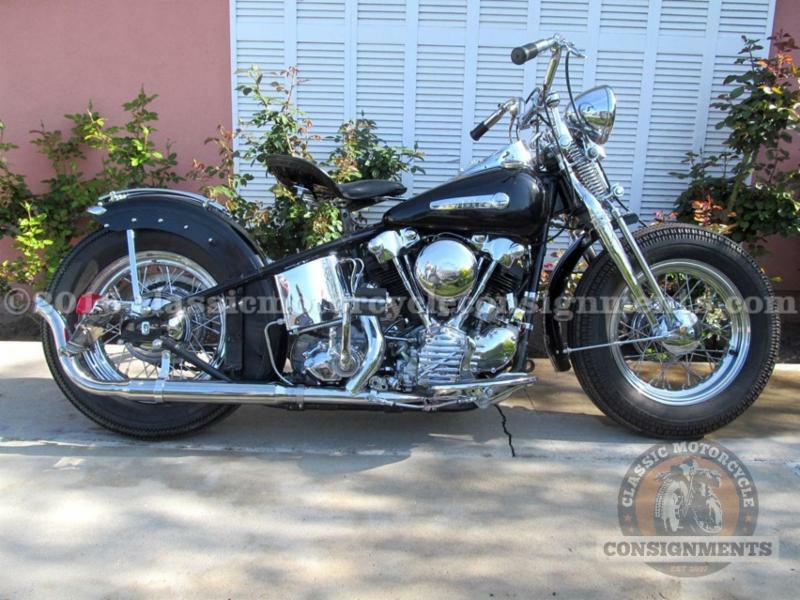 Classic Motorcycle Consignments also handles estate inventory planning and valuations. Please keep us in mind if you would like to do estate planning on your motorcycles or a motorcycle collection, large or small. We have several happy clients that sleep well at night knowing that their personal inventory is listed and priced out in case needed by the family members. Have a great year, and thanks for reading! Tim is available just about any time via email or phone to discuss your personal needs. Cheers from Tim and the Staff at Classic Motorcycle Consignments! Which of the above 3 is your favorite and why? Come on by our booth and say Hi! WANTED: 1930s Indian Dispatch Tow & Restorable Projects if Complete. First of all . . . . we'd like to wish you all a Happy & Healthy 2018 and hope the holiday season was filled with new memories and lots of fun! SPECIAL REQUESTS FROM OUR WANTED LIST!! • We have a client that would like to purchase a 1930’s Indian Dispatch Tow, much like the beauty displayed below. He primarily needs a complete assembly, with a perfect restoration, and in great running condition. • Also, we are interested in restorable projects if they are complete. What do you have to offer? Christmas Specials & Book Bundles! • Just Reduced Prices on these Christmas Red Motorcycles! • Don’t forget to Shop our Book Section for the Stephen Wright Books! These are some of the best motorcycle books ever written! We have two Christmas Bundle Specials, valid thru 12-31-2017. Above Shipping Options for both Bundles are available in the US ONLY. Place your order soon to receive these in time for Christmas. Big Tim says he will lower his commission to 5% for any motorcycle sale paid in full by December 31, 2017. So, check out the bikes for sale and negotiate for your favorite one now! Questions and discussion are always welcome. The following bikes are ready to be sold, new owner needed! Prices are dropping so that these sellers can move on. Take a look at these bikes to see if you, or someone you know, could be the new owner of one of these great bikes. Each of them are excellently prepared and ready to be consistent, reliable riders! 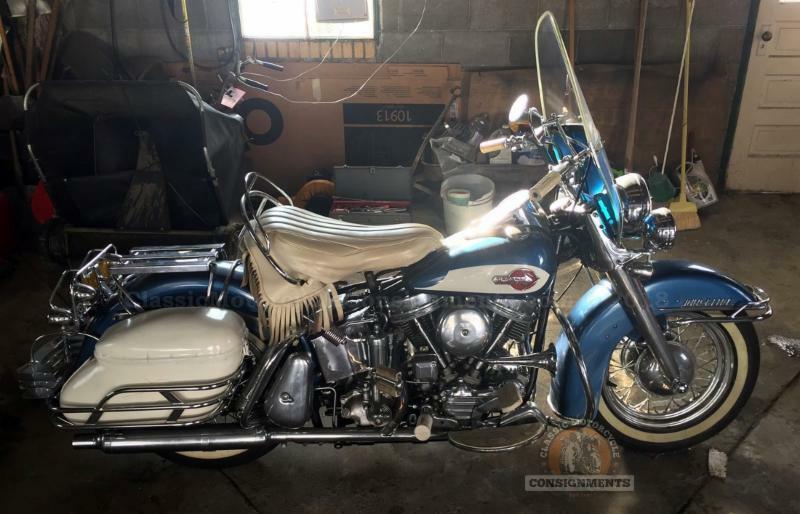 Please Click on Bike Photos to see DETAILS and MORE PICS of these Great HARLEYs! Thanks for your continued support and reading our occasional emails! Hello Classic Motorcycle Consignments Newsletter Subscribers! Just a quick note to thank you for looking and increasing our subscriber list. We have had a great year and would not be here without you. It is time for me to get on the road and do my Vagabond 2017 Tour. My wife Janis and I started out in the RV on May 30 and we will be on the road until October. No, not really a vacation, just a movable office with the ability to seek out great motorcycles and motorcycle events for our customers. Follow us on Facebook to get the latest info on our tour and tour locations. The Office is currently in Kanab UT, headed for Denver. We will then mosey up to Montana and through Idaho and Washington before pointing south for Home in Orange County. If you are near our vagabond route and want to say hi or have an inventory that needs to be itemized and documented or offered for sale, give us a call or email and we will set an appointment to head your way. We did spot a nice looking 1974 BMW R 90/6 in Cedar City, UT if anyone is interested. We've visited friends and clients in central California and came away with a 1971 Honda 175 for our RV motorcycle. The Dixon AMCA Swap Meet was a lot of fun and while there we actually consigned a 1914 Excelsior Single (older restoration) that will be on the site soon and we also picked up a 1911 Harley 7A, all original including the paint! Very cool items on it and the engine number is "7A" which is rumored to be THE bike used for the ads! We are going to do research on this and see what we can find. If you have input on this 1911 Harley Davidson, please drop us a line at Tim@ClassicMotorcycleConsignments.com or directly on Facebook for all to discuss. So, possibly we will see you on the road or enjoy your comments on Facebook as we cruise through the west picking those hard to find motorcycles and motorcycle parts! Price Reductions, New Listings, and Exciting Things Coming Soon! Newly Listed on the Site! We're proud to offer these three newly listed bikes as well as this classic Corvette convertible. Stop here on the site and check them out. We are proud to be offering this collection of the four Civilian models produced by Indian Motorcycle in 1942. As 1942 was a war year, a very limited number of civilian-model motorcycles were produced, with civilian automobile and motorcycle production ending officially on February 9, 1942. Check here on the site within the next couple days to see this awesome collection! • 1913 Excelsior 7SC JUST SOLD!! The Mesinger Tandem Seats are selling well at the at swap meets across the country! Excellent product!! Delivery times are starting to lengthen a bit so now is the time to order your Mesinger Tandem Seat for this summer's riding season. Check them out here on the site! A Harley, an Indian, and a Vincent! 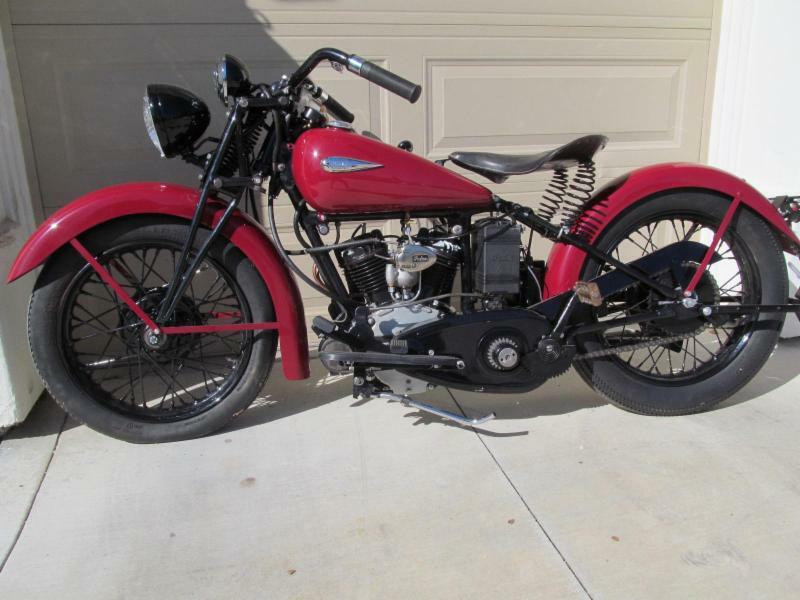 Client says move that motorcycle, so this historical 1950 Harley Davidson WR has been reduced in price. You can buy it from eBay or direct from Classic Motorcycle Consignments. eBay price will be an opening bid of $25,000 with no Reserve closing in a week. 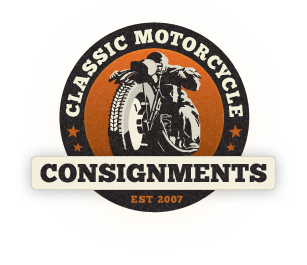 Classic motorcycle Consignments will accept the first full offer in the listed range. Go HERE to take a look and place your bid! This motorcycle ships from The Los Angeles area. It has a clear California Title. 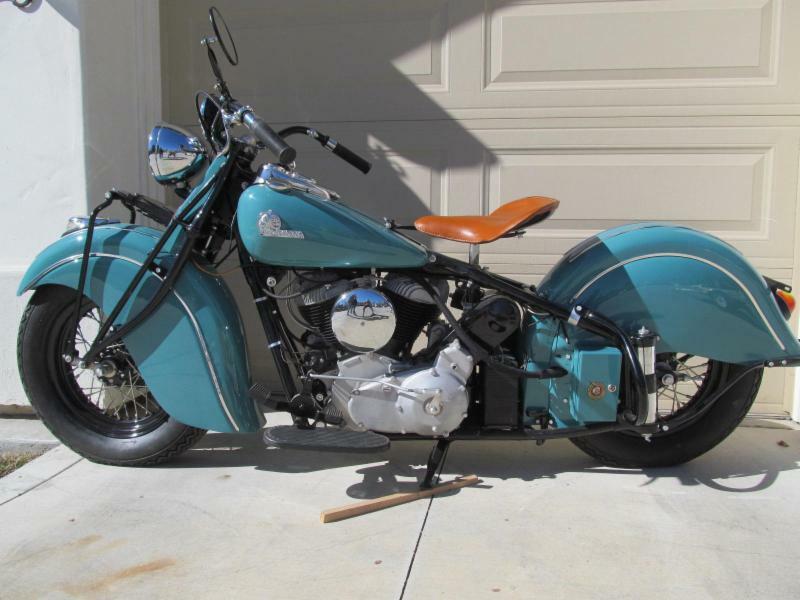 This 1941 Indian Scout 741 Military Motorcycle has been reviewed by an Indian Specialist and he has pointed out many items on this motorcycle that are 1941 production only. See more photos and details HERE. This 1941 Indian Military Scout appears to be a restored motorcycle with fresh paint and engine number indicating a case replacement. 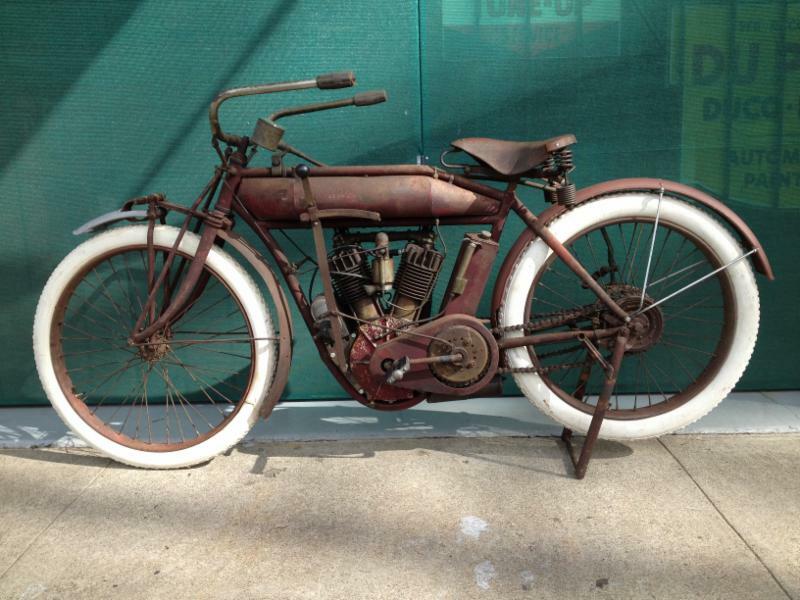 This motorcycle was recently sold by a museum in Ohio where it had resided for 20 plus years. Sold on California title, this motorcycle is again ready for show and go. This 1952 Vincent Black Shadow Rapide Motorcycle was acquired by the current owner in 1998. According to the previous owner, he had the bike for 30 years. This 1952 Vincent had a genuine Shadow engine with an earlier Rapide frame. The bike had been partly “lightningized” by a previous owner. See more photos and details HERE. 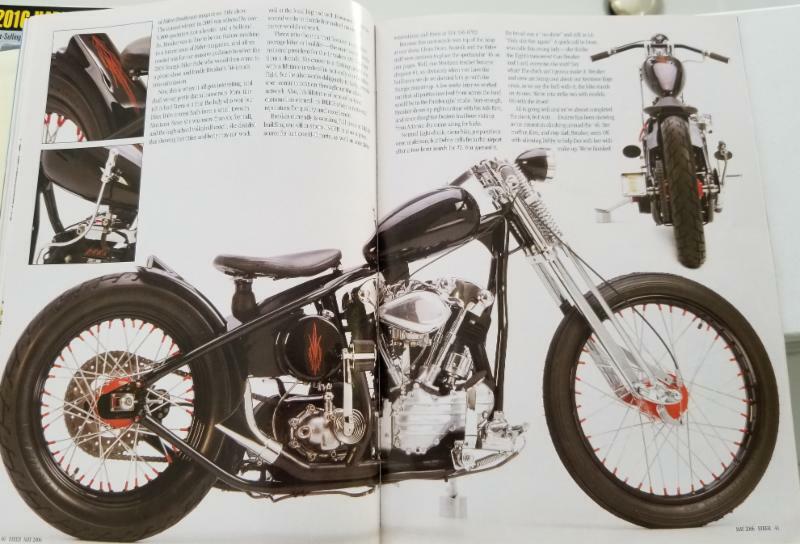 Prior to purchase, the current owner had the bike inspected by an expert who confirmed that it was not an original Black Shadow, but a Black Shadow engine installed in a Rapide chassis. Most recently, the bike was serviced in Orange, CA. This Vincent is of original parts and it is a road machine. It is ready to ride and has serviced regularity. This Vincent has a clear California Title that shows Frame number and engine number. It is currently registered for the road. Questions and discussion are always welcome. Call or email anytime at949-254-6551 or Tim at Classic Motorcycle Consignments. Newsletter -- 2-27-17 -- 1913 Excelsior 7SC Race Bike! 1913 Excelsior 7SC Race Bike! The seller of this excellent, ready to ride, machine is motivated to sell. There is no room in the front room and a new project is looming. Is it true the wife says move that one before you bring in another? Time to make serious bids and possibly have it shipped out in time to test on the track against the replicas being raced in Daytona in two weeks. As usual, call or email anytime to discuss, Tim Classic Motorcycle Consignments. Tim and the Staff at Classic Motorcycle Consignments! Check in to the site often to see what we have and feel free to share our newsletters and other posts to Facebook and other social media.